Sorry... the 2017 Honda CR-V is no longer being sold as new. Instead, take the first step to a great deal on 2019 Honda CR-V with a free price quote! The 2017 Honda CR-V is a popular compact SUV that seats up to 5 passengers. It competes with the Ford Escape, Mazda CX-5, and Toyota RAV4. This year, it has been completely redesigned. Four trims are available: the LX, EX, EX-L, and Touring. The new, fifth-generation CR-V has an elaborately sculpted, rugged-looking appearance. The front grille is a multi-layered ensemble of overlapping chrome accents and hexagonal pattern mesh. The lower fascia has a big-mouth air vent flanked by C-shaped motifs. Sharp creases at the rear fenders along with a unique taillight design add visual interest to the back of the CR-V. Standard features include LED daytime running lights, power side mirrors, active grille shutters, and 17-inch alloy wheels. LED headlights, front fog lights, heated side mirrors with turn-signal indicators, a power liftgate, and a dual-pipe exhaust system are also available. Under the hood, the CR-V LX is powered by a standard 184-hp, 2.4-liter 4-cylinder engine, while the EX, EX-L, and Touring trims have a more powerful and efficient 190-hp, turbocharged 1.5-liter 4-cylinder. Both engines are mated to a continuous variable automatic transmission (CVT) and standard front-wheel drive (FWD) or optional all-wheel drive (AWD). Fuel economy for the 2.4-liter/FWD models is an EPA-estimated 26/32 city/highway. It lowers slightly to a 25/31 mpg rating for the 2.4-liter/AWD models. For the Turbo 1.5-liter models, the fuel economy ratings are 28/34 mpg (FWD) and 27/33 mpg (AWD). Inside, the CR-V has an updated cloth interior with a 60/40 split-folding rear seat. It has a maximum cargo capacity of 75.8 cubic feet with the rear seat folded down. The center stack features a standard multimedia system with a 5-inch display, Bluetooth connectivity for phone and audio, and a USB port. It can be upgraded to the HondaLink multimedia system that includes a 7-inch touchscreen, Apple CarPlay/Android Auto compatibility, an integrated navigation system, and a 330-watt premium audio system. Automatic climate control, power windows/locks, cruise control, and remote keyless entry come standard. Leather upholstery, power/heated front seats, a leather-wrapped steering wheel, a dual-zone automatic climate control, and rear HVAC are available as well. Standard safety features include an electric parking brake and a backup camera. 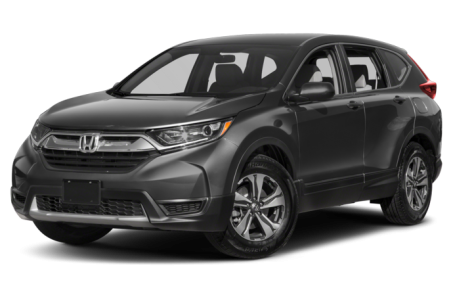 The optional Honda Sensing package is a suite of active safety features that includes adaptive cruise control, a blindspot monitoring system, rear cross traffic alert, a collision mitigation system, lane departure warning, and lane keep assist. 441 of 445 (99%) consumers said they would recommend this vehicle to a friend.